Take a little less than a quarter cup of quick oats, 1 egg, a small handful of blueberries, and some brown sugar or Stevia if you like things sweet, and mix it all up in a coffee mug. If you want your muffin a little moist a tablespoon of plain soymilk or almond milk will do it. Then place in the microwave for 1 min. Watch it carefully! This could overflow! If the muffin top does not look firm, place back in 30 sec at a time. Once ready, flip mug upside down onto a plate and slice some fresh strawberries to decorate. Super yummy! I served this to my sister and she was so impressed with my quick healthy cooking skills. Try it! Let me know what ingredients you end up using! There’s a lot of room for creativity. I absolutely love this recipe! It was super simple, quick, and yummy. I substituted banana in for the blueberries and it tasted so good. My Mom tried it and was super impressed. I followed the recipe exactly… It just didn’t turn out right at all! Smelled less-than-nice, and even my mom, who is NOT a picky eater, said she thought it tasted like scrambled eggs mixed with oatmeal with some blueberries, which is essentially what that is. gross!! Language like that from Mary should not be posted!!!!!! Disgusting!!!! I made this with peanut butter and banana, and it was HEAVEN. I kinda fucked up the “healthy” bit by adding chocolate peanut butter sauce, but it was delicious. Will definitely make again with different fruit. Could you get salmonella from the egg being raw? No because when you put it in the microwave the egg cooks. Would it be possible to bake this in the oven if i wanted to make a batch? If it is possible, How long and what temperature should i set it for? Give it another go, Katie. It really is simple and yummy. I am a guy and I managed to accomplish it this morning. My wife said it was really good. I first mix abit of manuka honey into 2 tablespoons of low fat milk, add 1 egg white, and half a regular mug of oat. Mix well. Then added half a banana (meshed) and about 12 blueberries. Mix well and even. The whole texture should be sticky and thick by now. As i do not have a microwave oven, and i am not sure if i can put the mug in the oven, i inverted the mug on an oven tray and the whole content sit perfectly well, keeping its mug shape. I only have a simple tabletop oven, preheat it for a couple of minutes before putting the tray in. I set it for about 5mins, but i monitor it closely till it look less moist and firmer, less than 5min overall. Viola! It should taste better than your first try as we didnt use the egg yolk and the honey and banana should overpower the eggy taste, with slight citrus from the blueberries. Mine didn’t turn out well either but when i looked through the comments and saw this, I tried it and loved it! THANK YOU!!! Tried yogurt, instead of egg, turned out very runny. I had the oatmeal, yogurt, banana, nuts, chocolate chips, walnuts, so then, I added the egg to mix (turned Brown since my chips melted and micro again 1 minute since it was runny, and “Wa-la!” It stuck like a muffin. Ok, so this is a quick oatmeal style muffin, not bad. Not a muffin without the egg. Still healthy. I’d give it a ⭐⭐⭐⭐. Great recipe! Never thought of making this. I tried it with mashed banana and another one with cinnamon chips! Super yummy! i added half a banana and a little manuka honey. IT WAS HEAVENLY! please try it! i am disappointed the points value i calculated 7 points for this muffin …BERRY DELICIOUS MICROWAVE MINUTE MUFFIN . THAT IS ALOT. You can use anything you like. I change it up everyday. Hey Cassey! Just wondering if we could use something in the place of oats. Since I don’t have oats, would it be alright to use wholemeal flour? Love it!!! I added strawberries, cinnamon, brown sugar as my sweetener, a small amount of a banana, vanilla extract and baking soda for it to rise… It is awesome! So I made this this morning and it was super yummy. I used raspberries instead of blueberries. But I was wondering how this came out to over 300 calories? By my calculations it was only about 180. Did I miss something? I made it but I didn’t put any sweetener. I substitute it with a mashed banana. Oh man…..So good! How much Greek yogurt did you use? I don’t have a microwave – could i make these in the oven instead? I make this all the time, but I alter the recipie a little bit and it tastes really good, like banana bread. I swap the egg for one egg white, add a banana, and add half a scoop of vanilla protein powder. It tastes amazing! Is there a substitute for the egg I’m a vegan and I don’t want to ruin the diet just for this one recipe. Try mushed up bananas or applesauce as an alternative. Yeah, smart thinking! You’re the best! Good luck! Ok so I tried this recipe exactly how you did it in the video and it just turned out like a giant scrambled egg. It did not taste good at all. What did I do wrong? I only added one egg as the recipe suggested. Yum, tried this with strawberries and brown sugar, it was delicious! I just tried this recipe with a banana instead of blueberries and some cinnamon and it’s so good !! so glad its a rest day today!!! I’m looking through some of these comments, and I saw someone say they just used the egg whites of one egg and it turned out fine. So maybe that might work? Best of luck! Vanilla really helps the taste! Since it’s coming into Autumn here I just added raspberry jam on top and with plain yogurt It’s really tasty! thanks for the vanilla tip! I make something similar all the time! It’s low carb (made with flax seeds instead of oats). I always add some mashed fruit to it as the sweetness source. Just google one minute flax seed muffin and you should see it if you’re interested. I’m trying it with strawberries right now – so far so good. Tried this, but we had no berries on hand (???!?!!!!!!) so instead I used a few mini chocolate chips. It wasn’t bad! Maybe a bit dry, and you can kind of taste the egg. Next time I might add some other things and serve it with greek yogurt. I am new to your blog and I have to say, Iove it! Keep it up Miss Cassey. I just started my own blog. I’m trying to make a better me (in a year, six months into it) and your ten minutes a day with be an extra plus. Going to mention you in tonight’s post. Ciao. Has anyone else found these to taste a little eggy? I followed the recipe and added a dash of cinnamon. I am not a fan of eggs so I used one between two muffins. I added 2/3 cup almond meal, handful of blueberries, teaspoon sugar, teaspoon cocoa and some coconut. Took 2 minutes to cook. Served with natural yoghurt. Yummy. I then mixed this thoroughly and microwaved it. When it was done, I tipped it out of the mug and tidied up the edges with a knife. I then spread almond butter on top in an icing-like fashion and used a teaspoon to gently shake cocoa powder on top. It tasted a lot like real chocolate cake! I’m not even kidding. Ew. Sorry, love you Cassey but these were disgusting! All I could taste was the egg and that had a super gross texture. This came out really nice! I made it with little pieces of apple instead of blueberries, put in some honey, and moistened it with some almond milk and soy egg nog! YUM. I just made this using one egg, about 1/4 c of instant oats, less than a tsp of milk and about a tbsp of shredded cheese (I had a triblend of colby, cheddar and something else). I mixed it all up and put it into the microwave for about 50 seconds. It was so good!!! It tasted almost like an Egg McMuffin! I added a teaspoon of dark brown sugar to mine.. my boyfriend added Pumpkin Spice International Delight Coffee Creamer to his.. and we both put some honey on top, was really good! BUT, maybe our mugs were too wide? We came out with like a 3 bite muffin. Rofl! OhmyGOD made it for first time and I love it! Replaced berry with bananas and drizzled honey over it after it was done and it was really good! My new breakfast before school!! How much should I let it bake in a regular oven and what temperature? Made it this morning but instead of blueberries, I used banana, and added cinnamon. I used old fashioned oats but I milled half of them in the nutribullet so it would be like flour, then left some whole. It was so yummy! I thought it was pretty good. I’m not used to using stevia, so it tasted alittle odd to me, but I could see eating it once a week or so. I’m trying to slowly replace meals with these healthier recipes so I can eventually do the 90 day challenge. I do have 2 other liquid sweeteners I will try with it. I also had to use old fashioned oats, but I knew it would make it chewier, so that was fine. I could see using cherries or any other berry for this too. May try some almond milk in it next time too. Hey I have a egg patty maker for the microwave. This would be really good on a muffin or bagel. Since it makes it round maybe you could use it as a dessert too. Drizzle alittle icing on it? Sounds good to me. Thanks Cassey! I woke up early to make this, but it was gross :( It tasted like blueberry cardboard! ohmy!!! i made the healthy cheeseburger, ended having two to myself. i made the blueberry muffin today, i ended up making 2 cux theyre so YUMMY!!!! ohmy!! Anybody know of an adjustment to the recipe to make it taste less spongy? All I could taste was egg. Usually when I make regular breads I use no sugar added applesauce! I would sub the egg for a little less than the individual sized cups (probably about half for a recipe this small). Ooh Ohh! What if you use cherries (after it’s pitted) and throw chocolate chunks in! It could be a chocolate covered cherry dessert! I could see a lot of desserts with this. Mint leaves and chocolate for an andes mints, white chocolate and raspberries for white chocolate raspberry, etc. If you put liquid in it, you could put flavored creamers! I’m thinking cinnabon cinnamon roll? Creamer isn’t too high in calories and you wouldn’t have to put much. You could throw pumpkin in or pumpkin creamer, could make eggnog that way too. Wow I’m exploding with ideas on this one. Yummy, but mine turned out spongy and sort of tasted like scrambled eggs. Did I do something wrong? Same here! Were you able to alter your recipe to get better results? all low carb recipes call for eggs and usually you can taste them ….the price for going low carb ! I also use flaxseed ( ground ) instead of oat ” flour ” you can use almond ” flour ” too . What are the nutrition facts on this cassey? Absolutely love all of your recipes. Can’t wait for more. Doing the “eatclean” thing to get my abs back. I can’t thank you enough. Well…I can tell you that if you take 1/4 cup blueberries that’s 20 calories, 2 grams of carbs. 1/4 cup oats is 75 calories and 11.5 grams of carbs. An egg ranges from around 80-90 calories. So about 185 calories, and if you don’t add sugar, no added sugar :). Eggs have about 6 grams of protein. Hope that helps! i didn’t have berries so i used mandarin. probably why it turned out all gooey and oaty. I’m lucky it still held it form. Very quick and easy, but mine didn’t rise that much, it looked more like a small cake. Not so bad if I say so myself. only thing is the apples were not done :( oh well. Thanks Cassey! Plz share more recipe with microwave !!!! quarter cup of wheat germ, 1 egg, a small handful of ,apple and sliced almonds, and some brown sugar! and a all round enjoyable blog (I also love the theme/design), I don’t have time to read it all at the minute but I have saved it and also included your RSS feeds, so when I have time I will be back to read much more, Please do keep up the excellent job. I want to pin this on Pinterest! Do you have a ‘pin it’ button I am missing somewhere? I tried it with raspberries and honey drizzled over it, so good, and surprisingly filling! Was a little wary about microwaving an egg, so I might have over cooked it a bit, haha. Can’t wait to try more recipes! This morning I made it with some chopped apple, cinnamon, and honey this time. It came out so moist, sweet and perfect. I love these things! I put a half scoop of vanilla whey powder in mine, with cinnamon and blueberries. SO GOOD! hey, i absolutely adoreeeee this recipe. i replaced the berry with some tuna, added some chilly powder for a spicy taste and it wasssssss amazing, i just cant get enough. Tried it with some chicken but it was not that great. the fish gives it a special taste…… thanks for your ideas, they’re great! ABSOLUTELY making this tomorrow morning!!! I love these! The’re so quick, and simple, but is there anyway you could tell me the nutritonal value of them? If you could that would be fantastic! Thanks! Thanks for the idea Cassey! If you use craisins instead of blueberries and put some lemon zest in the batter (just get a grater and grate off the yellow part of the lemon peel) you get a lemon cranberry muffin. it’s so good!! I found that it lacked a bit of flavor too, so I drizzled a bit of honey over it. And it also may have been a bit undercooked at the bottom. It’s never the same cooking time as recipes on my old microwave! But the cooked part was good. I will have to try it again. Hello everyone !! I recently moved with my boyfriend and since we were -let’s say it- poor, we were eating unhealthy food simply because we thought it was the cheapest way to eat… I took about 15 pounds and my abs were hid, my legs weren’t as firm as before… my bf has an 8 pack, and i used to be in shape… Cassey, thank you for posting easy to make, cheap and HEALTHY recipes !! Starting to melt that fat in the kitchen and in my living room !! I’ll be ready when snow will melt for hiking and rock climbing in the Rockies !! And by the way, since I started cooking healthy stuff, my bf loves me even more and ask for this minute muffin every morning ! HAHA. What he dosen’t know is that it’s so easy to do i don’t care “cooking” him brkfast every morning !! Thanks Cassey !! I glow frm the inside and the outside !! And don’t forget to drink minimum your 16 oz of water every morning !! It does make a BIG difference in only few days !! What is the password for the Phase 1: Bikini Meal Plan post? I subscribed to the newsletter but the password I received doesn’t work for that post! Cassey, help! I didn’t have any soft bananas (mine would have been impossible to mash with a fork), so I threw everything in the blender (1 large banana, 1 egg white, 1 package plain instant oatmeal, and just enough light vanilla almond milk to make it blendable). I microwaved it for 1.5 mins (I have a low watt microwave) and it turned out super soft.. almost cake-like thanks to the blending. Awesome breakfast…. or dessert!!! definitely gonna try this tomorrow for breakfast! Hopefully it’ll turn out good! It was actually so disgusting!! The egg should definitely be reduced! I did it exactly the way she did and it turned out to be a yucky hard omelette!! Optional (but really tasty) add one/some of the following; small amount of peanut butter, honey, brown sugar, cinnamon, coconut, berries etc. Whatever you fancy! I doubled your recipe and divided it into two mugs. 2 wonderful muffins in less than 5 minutes! Thank you to you and Cassey for this great recipe! It was alright. Kind of rubbery. I eyeballed most of the ingredients though. I’m pretty sure I added in much more than 1/4 cup of oats, maybe even 1/2 a cup. Considering this was made in 1.5 minutes in a microwave, I didn’t have high expectations for it. I’d probably make this again if I was super hungry & lazy and didn’t have anything else at home to eat. I think the amount of egg should be reduced :/ and I don’t know why mine turned out like super hard and unedible! You should add a little bit of water, see if that will help! :) Hope it does! I think the whole egg is a little much. It overpowered the taste of everything and gave it an omelett taste. Maybe half an egg white would be better since it is only 1/4 cup of oats. That sounds discussing! A whole egg in one little muffin? It’s pretty much an oat and berry omelette. Egg is unnecessary and just gross….I might try and rework this without egg. It has too much of an egg taste. I think I cooked it too long. this was disgusting. I tried substituting the egg with banana, and it was still nasty. So I tried to make a savory version with tomatoes, spinach and feta and it was STILL AWFUL. I used half oats-halfoat brans and fresh blackberries. My 13 year old son made this as written, except he used frozen mixed berries and added some chopped walnuts. It was definitely muffin-like and not eggy after microwaving it for about 3 1/2 minutes. He really enjoyed it. Simple and healthy breakfast. Thanks for the great recipe! tried this with apple and cinamin… yum! cant wait to try it with blueberries :) your amazing cass! It tasted like an omelette. I used fresh strawberries chopped really small and toadded a tbsp of oat milk to try to moisten it. I suggest adding milk and honey to the mixture. I think it would be yummy at lunch with tomato, spinach and maybe some reduced fat fetta cheese instead of sweet things. I’m not an egg lover at all, so I was a little hesitant about trying this. Afraid it would be too eggy. I was surprised. It wasn’t too bad. Don’t know if I’d say “delicious”, but not bad, and I’d try it again for sure. I mixed everything up in a small bowl first (so there would be no traces of egg bits!) before putting it in the cup (except for the berries), added a little milk and a tiny bit of brown sugar and cinnamon. 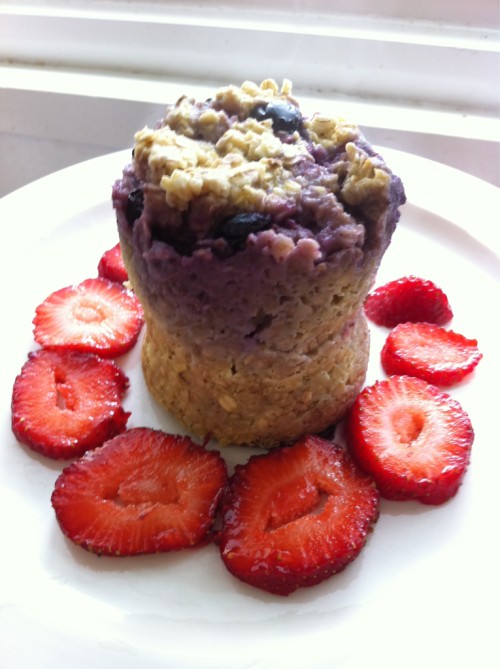 It’s not like a regular muffin, but I think it’s a good, quick healthy breakfast. Thanks! BTW, I’ve just recently discovered your videos. Love them and your presentation style! Have a great day! Hey, i just came across this link and it looks super easy!! Going to try this out tonight and will come back with another comment. Just came across this on Facebook and I made it this morning…I loved it…not really a “muffin” but so interesting, can’t really describe it…I used lots of blueberries and a bit of coconut milk and honey… it made the best syrup when it was finished…I am going to try peach tomorrow with a dash of raspberry jam- no sugar added and just egg white…don’t want to eat too many eggs in one week and I think I will be making this a lot. I did beat the egg first and then added to other stuff and mixed it all up. Just made this for the first time today with a few modifications- didn’t use any egg cos I think it’ll taste too eggy otherwise. 1. Microwave 1/4 cup oats with a dash of milk (not too much) for 1 min. 2. Mash up a banana and add it into the oats with the blueberries and add a little bit of dark muscovado sugar- you can make it as sweet as you want it but if you wanna be healthy and the banana is sweet enough then you can omit the sugar. 2. Microwave for 1 min- enjoy! I’m eating this right now… and WOW it’s so amazing!!! Super easy. I put 2 tbsp of ground flax seed and 1/2 banana instead of egg and blueberries. Love you, Cassey!! But I used a kiwi and it was awesome!! Do I have to use the yolk of the egg? or can I just use egg whites? amazzzzzing! i did put the quick oats for 3o secs in microwave then mixing in the rest of ingredients. lovelyyyy! A teaspoonful. Or you could always use your imagination..
Made this and it was AMAZING. A new breakfast favourite. I used frozen mixed berries. Why did it taste so eggy? I added everything including a little bit of brown sugar but it tasted just like eggs with blueberries in them. What can I do to make it not taste so eggy? Please help me! I’m dying for alternatives for my terrible sweet tooth! Thank you!!!! I just made it, and I did not taste the egg at all. But, I mixed it very well in a bowl first, then put it in the cup. That was so disgusting, it was just runny egg and kit wasn’t thick at all. Try to get your measurements right, I did not know how much brown sugar to put it. I had to add flour to make it thicker. This sounds sooo yummy, but what are the nutrition facts? I can’t wait to try it! Mine did not turn out like this…but it was still very tasty. I didn’t cook the oats and think maybe that’s the key. Someone please clarify! — Do we cook the oats first or mix them in dry??? Big question: do we cook the oats? Try this with honey, and milk in the mix(really lite though) and like a quarter of a banana. So delicious. My blueberries were all old so I had to throw them out! But I made it with mashed up bananas and it was so good! The banana sunk to the bottom and was like a sweet topping. I love this. I’m definitely going to be making this quite a bit. I just tried that now and it’s absolutely delicious!!! And my stomach is full! Also, I was thinking, I will probably try this recipe in a “salty” version, with vegetables (tomatoes, peppers, onions, garlic…) and a little bit of fresh herbs (like basil or parsley), salt and pepper… Will probably be super yummy too! Thank you for this recipe Cassey, you rock!!! So i really want to try this!! But i have a few questions are you supposed to use a raw egg or cook it and then mix it up? and also i saw some people saying theres didn’t make a form it just looked like oatmeal how do you make it take shape of the cup?? Tried this for my breakfast this morning. Mine didn’t look anything like the picture though. It didn’t raise up in the form of the cup and came out more like chunky oatmeal. Tasted okay but don’t know what I did wrong! I made this and didn’t realize i need to cook the oats before putting them in the cup. Whoops! It turned out more like an omelet lol. I made this for breakfast for the first time today and it was delicious!!! I used liquid egg whites, a little brown sugar, a touch of almond milk and fresh mixed berries… super yummy :-) Thanks for the easy and healthy recipe! I made it and it was great! I suggest that you pound the egg first, and don’t use a really big egg. Is there anything that I can use in place of the egg? I’m a vegan. Thanks!! I always add some raspberries and half a banana and no sugar (because of the sweetness of the banana). And this mix is SOOOOO yummie!!! I’m so curious of it. I will do it tomorrow, I promise! And I’m so happy, because where I live it becomes a fresh, regional, veggie-fruit season. There are tons of youn berries, tomatoes, potatoes (there are much healthier ant tasty than tipical ones), strawberries, cabbages, and more… There are tons of it in every shop, and they ara locally grown!!! Am I crazy by being excited of food?? I did this with chopped strawberries instead of blueberries. It was delicious! This just joined my breakfast inventory. I’m so gonna try this, gotta check on the quick oats though, i don’t exactly know what it is (i’m dutch haha) and i’m not allowed to have wheat. I made this for breakfast this morning and it was amazing! I have two little boys and I litterally have two minutes to eat, this is great and so quick! Made mine savory and it turned out great! Ahhhh delicious!! Your blog is amazing! I used regular oats and it turned out just fine. I also used half of a mashed banana, a pinch of brown sugar, and a splash of rice milk. :) I smeared about a tablespoon of pb on the top as an extra treat. Thank you! I’ve made this most mornings since I found this on pinterest! Its perfect breakfast…fast, good morning fuel, and a good balance of nutrients. I change mine up most of the time…apple cinnamon, blueberry, strawberry, plain with just a touch of brown sugar, and I even added a touch of cocoa powder and its a great fix if you are craving something sweet! I add milk, but its still on the dry side but it doesn’t bother me. I cut it into bite size pieces, put it back into the mug, and eat it on my way to work. SUPER FOOD! I tried this with blueberries AND strawberries and neither worked for me. They tasted weird and smelled kind of bad. But, when I mashed in 1/2 a banana in there and a bit of brown sugar – AMAZING. I leave it in the microwave for 1min30sec. I also discovered adding protein powder is a total disaster lmao. I made one with 1/2 a banana, 2 tbsp of peanut butter powder, 1 tbsp flax meal, 1 egg, 1 tbsp unsweetened almond milk, 1 pkt. stevia. It came out a little dry-might add another tbsp of almond milk next time. Tasted great! I tried this recipe the other day with sugar and mixed frozen berries. I didn’t have the problem with it being a bit gooey or eggy. It was a bit dry though and filled me up for hours. I tried it a second time today, 1/2 cup oats, 1 egg, about 1/4 cup milk, 1 tbsp peanut butter, 1 tbsp sugar free jam and gave it a good mix. Into the microwave for approx 2 minutes and it was moist, sweet and delicious. I think I’ve found my new sneaky treat thanks!!!! Thanks for this! Made mine with regular oats and it was so yummy. I used strawberries instead of blueberries, a dash of brown sugar and a teaspoon of almond milk. For the people who couldn’t get the same consistency w/ regular oats: add a small amont of milk, and microwave for a lil bit longer, about 2 mins, the crunch from the reg oats is great! I came across this recipe on Pinterest awhile back and referred to it this morning when I was feeling less than inspired to make breakfast. This is an awesome option for a quick, satisfying breakfast or snack. I made mine with somewhere between 1/4 to 1/2 cut of Quaker one-minute oats, a large brown organic egg, approx. 1 tsp of regular milk, a sprinkle of brown sugar, some ground flax seeds, and blueberries. I microwaved it in pretty normal-sized, ceramic mug. No problems at all with eggy messes! – Not all mugs/microwave containers will cook the same. Perhaps try a different container? – Even 10 extra seconds of microwaving can make a big difference. After the first minute mine hadn’t risen and was only filling half of my mug. I added an extra 30 seconds (as the recipe recommends) and it rose shortly after. I can’t wait to experient with different fruits and variations, and I’m super excited to have this option for breakfasts in the office. Thanks a bunch for sharing! I thought this recipe would be crazy because I never heard of a microwaved cake. I made it this morning with quick oats, splenda, 1 egg, sliced almonds and banana and coconut. It was great and not heavy at all. I’ll just replace the coconut next time lol because I don’t have any berries. Thanks a lot for sharing this recipe! It was easy and quick to make, mine turned out awesome! Tried this recipe as I longed for something sweet. Used 1/2 apple, 1 egg and 25 g of oat. It turned out to be ok, but not as good as I hoped. But i had some overripe bananas i was eather to use or to throw away. I took 1/2 banana, mixed it with a little bit of milk, and put it in the microwave for a few moments. This bananacream with the apple oat muffin was wonderful. Bit more calories, but you only need half a banana. Tried this today and it was great! So happy I found a new, easy breakfast :) Thanks! Hey Cassy i just tried your berrylicious microwaved muffin but insed of using berry i used cranberries which was lovely. Thank you for sharing all you recipes, I’m on the road to healthy eating & I’m also trying you blogilates 90 day challenge. I’m eating this right now and I must say it smells and tastes like heaven! Made it with raspberries, cinnamon and a bit of milk. Yummy! I didn’t even expect it will taste so good, I’ll be making it again for sure! Is frozen blueberries okay to use? this looks so good i’m gonna try this recipe tomorrow for breakfast! I can never exercise with/ to aonyne else. You are my one and only fitness guru! So many fitness instructors (in varied degrees of mal-intent, I’m sure), make me﻿ feel as though I’m not in their elitist athletic club; as though every trainer and fitness enthusiast was born on a stair-stepper with a protein shake and 6% body fat. It’s discouraging, even if it is all in my head. But, now I know that even if I don’t look good while I exercise, that will change and I believe that because of you! I tried this for breakfast this morning, and it turned out wonderfully! Make sure you mix everything well. This looks delicious! I can’t wait to make this tomorrow morning! I made this and it keeps turning out very eggy. I don’t know what I’m doing wrong, any suggestions please? I think it might be because I’m using extra large eggs? I am new and want to try eating clean and working out daily!!! I see a lot of people say this is good and a lot of people are saying it doesn’t cook properly so is there a reason for this? Can we use egg whites instead?! I also tried this. Yuck! A scramled egg with blueberries in it. I am so glad I tried it myself before making them for someone else! If someone else has better luck, let me know what I did wrong. Is the recipe missing something? I just tried this and it did not work! I was so looking forward to it but it was a soggy mess.I used quick oats, so I’m not sure what happened. LOVE THIS! Made mine with bananas cinnamon and nutmeg …..deeeelish! This came out very eggy with an unpleasant texture. I mixed everything well, but as others said it was more like scrambled eggs. I ate it, but wouldn’t make it again. I was so excited to make this…but it didn’t work! :( I used regular, not quick cook oats…and used all the other stuff. Pretty much turned to scrabbled eggs! What did I do?! Same here – I used old fashioned oats. I think it does have to be the quick cook. I never overflowed as suggested, or even came close. I know when I’ve cooked instant oatmeal in the microwave I have to watch it carefully, so same principle. There must be something in the instant and/or quick cook oats that cause it to rise better. I’m heading out to do grocery shopping so maybe I’ll pick some up and try again. I tried this twice and it just looks like a ball of scrambled eggs. Ok, this may be the most brilliant thing I’ve ever seen! Can’t wait to try it. This recipe did not work at all. It came out looking like a sad, decrepit egg mcmuffin. My brother said it smelled like ham. F-, will not be making this again. Try again! It really works and is delish. Mine was a dud too. It was like an omelet that went very, very wrong. Mine didn’t work either, it looked like an oatmeal baseball. I tried it though and the flavor wasn’t bad, so i went ahead and ate it… but it was definately a dud in the looks department! maybe it isn’t working because the microwave is too powerful… or maybe the coffee mug was too big…? might try to make these into “pancakes” though… a drizzle of maple syrup would have ben delicious. …? Made this last night, with the added milk and I used strawberries instead of blueberries, so yummy! I love this recipe! I made this muffin this morning and it came out great! Next time I will add some almond milk as it was a bit dry! Instead of brown sugar I used Xylitol sweetener. It looks and taste like sugar, but better!!! I’m not a fan of blueberries, any other alternatives? How can you not be a fan of blueberries! I tried making one using strawberries this morning and it turned out very well! If i don’t have instant oats, but normal oats, what can i add for it to fluff? I love eating muffins, yet shaving my muffin top off at the same time :)) I’m excited to try this tomorrow morning! Thanks Cassey!!! this muffin is AMAZING! I’m eating it right now and am savouring every bite! I calculated the calories and its only like 240 calories and that’s including the banana I had it with! I made this and it was super delicious, and it kept my hunger away! I added 1 TBS of cacao nibs, 1 tsp of oatbran and I sweetened it with honey and topped with homemade, un-sweetened applesauce! Thanks a ton for sharing this recipe. It’s perfect! Thanks for the recipe Cassey! I made it with blueberries and Quaker’s purple rice instant oatmeal (extra B vitamins!) and a bit of raw sugar and it was DELICIOUS!!! Blog post with pictures for proof.